Magic glass that empties and refills on its own! Have you ever seen a glass that can empty the milk on its own? Have you seen a glass that refills milk on its own? I bet your classmates also will not have seen one. Why not perform an easy and amazing magic trick to mesmerize them? Go ahead! The magic takes place in night time on a dark stage. There is faint light in the stage. First of all, you show the audience a glass full of milk. Then you take a straw and put the straw about 10 cm above the glass. The straw does not touch the milk. You, the kid magician, start drinking through the straw. Amazing! – The level of milk in the glass reduces! Then you put the straw on the table, and dramatically cover the glass with a towel. You move your fingers in dramatic motions. Then you remove the towel. The milk has reappeared! The secret behind the magic is our glass itself. First of all, you have to tie the string around the mouth of the smaller glass. 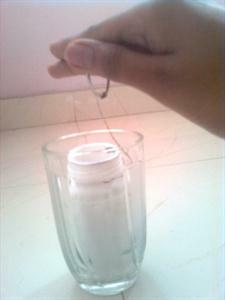 Then tie the other end of the thread to the finger-ring. Now insert the first glass into the second glass. There will be some space left between the bigger glass and the smaller one. Pour milk to this space. Don't let the milk enter the smaller glass. Now, if you look from outside, the glass will appear as a glass full of milk. Now we are moving to the performance stage. The stage must be dark. Before beginning the magic, you may slip the finger-ring that is tied to the glass, to your index finger. Now show the glass to the audience and tell them that this is a magic glass which can empty and refill on its own. Then put the straw to the mouth, and act as you are drinking through the straw, even though the straw doesn't touch the milk. While you are acting like drinking, gradually pull the string. The hand must appear as if you are performing magic with fingers. Once the smaller glass is raised, the amount of milk will reduce. Do not take the glass completely out of the bigger glass. Just raise it a little. Now place the magic towel on the glass. With this time, drop the smaller glass gradually to the bigger glass. Slip the ring off from your finger. Now show the audience a filled glass! Perform this magic only if you can raise the glass with your finger.